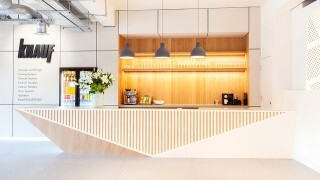 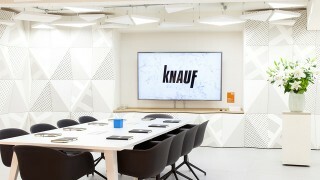 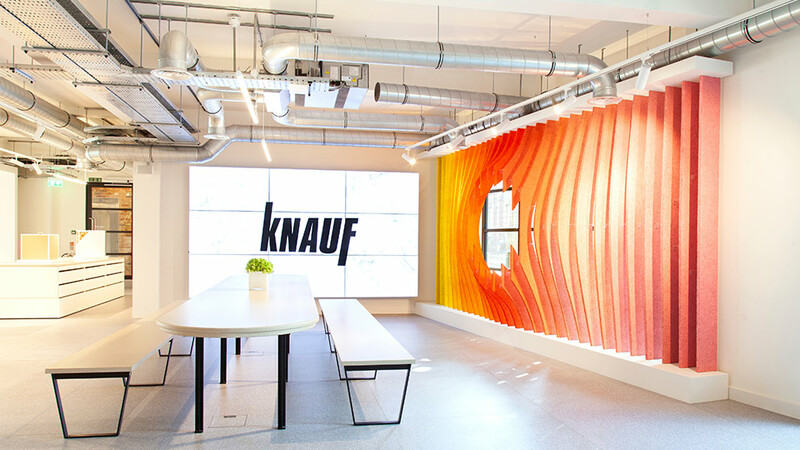 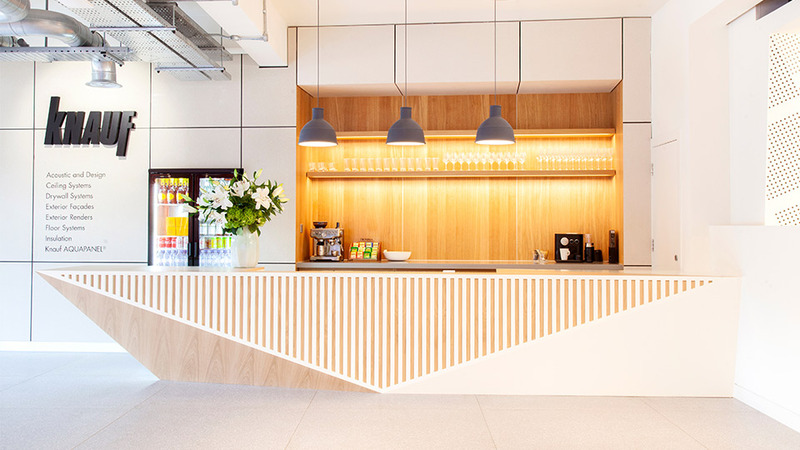 Knauf’s new Clerkenwell showroom presents its gypsum products in a stylish and innovative way: from geometric sculptures and acoustic panelled walls, to a colourful fan-like window installation and sleek, contemporary bar. 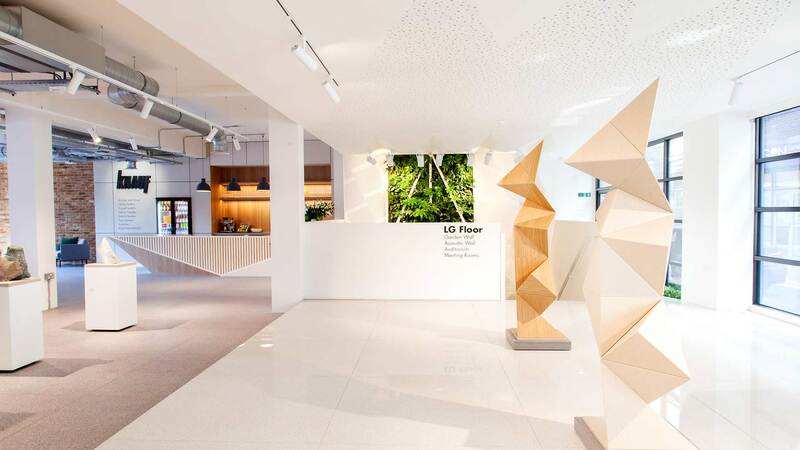 On the ground floor the architectural lighting scheme is simple yet considered, allowing the form and texture of the products to talk. 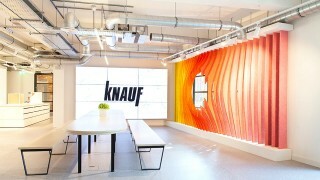 For example, spotlights highlight three human-sized installations in a glass-fronted gallery area – at night these statuesque sculptures are the only luminous objects, aside from a Knauf logo, and get the full attention of passers-by. 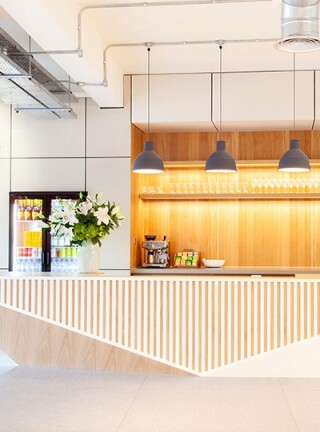 For accent and feature lighting in the showroom we opted for floor standing lamps and pendants over the bar, plus suspended lines of light above a large communal table. 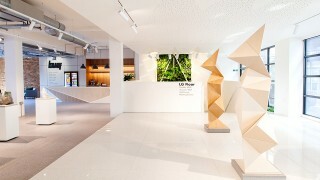 A central stairwell, accentuated by an illuminated green wall, leads to the lower ground floor where there’s a mix of presentation and meeting space. The low ceilings presented a challenge here, so we used light to make the space engaging and feel less basement-like. 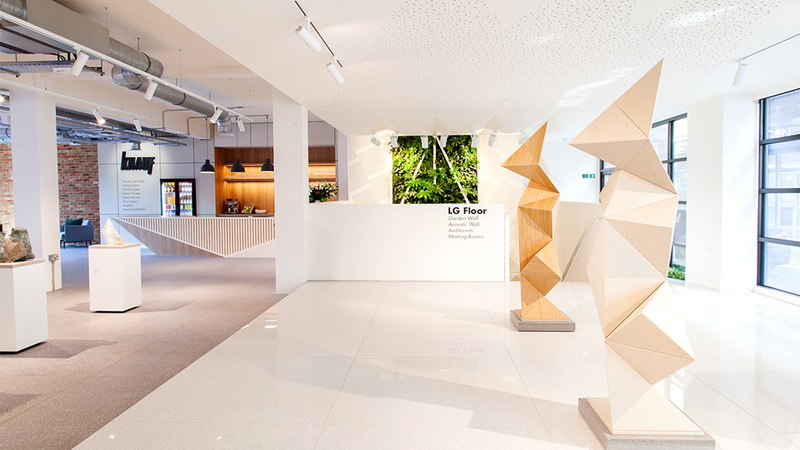 In one area triangular light sheets hang from the ceiling, replicating the folded, geometric walls – the light installation looks great, but also provides plenty of ambient light which makes the space inviting. 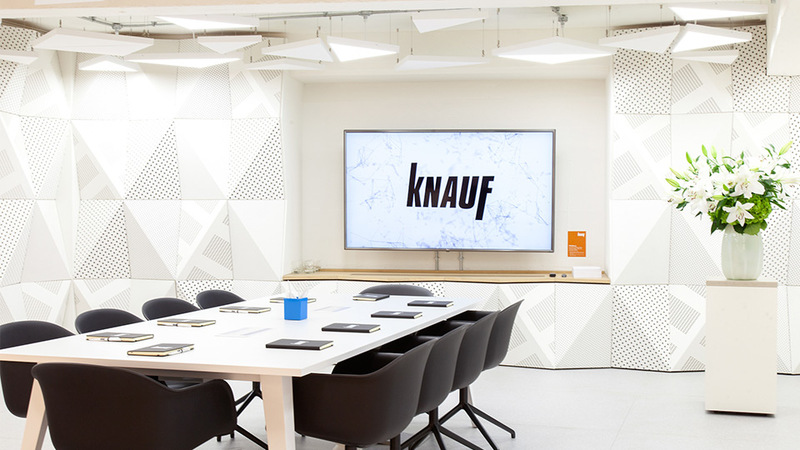 In meeting rooms walls are washed with light and Muuto pendants hang above tables, and we added a control system so light levels can be modified for events. 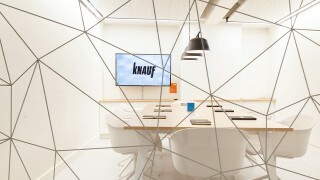 The successful collaboration between ourselves, MailenDesign and the client. 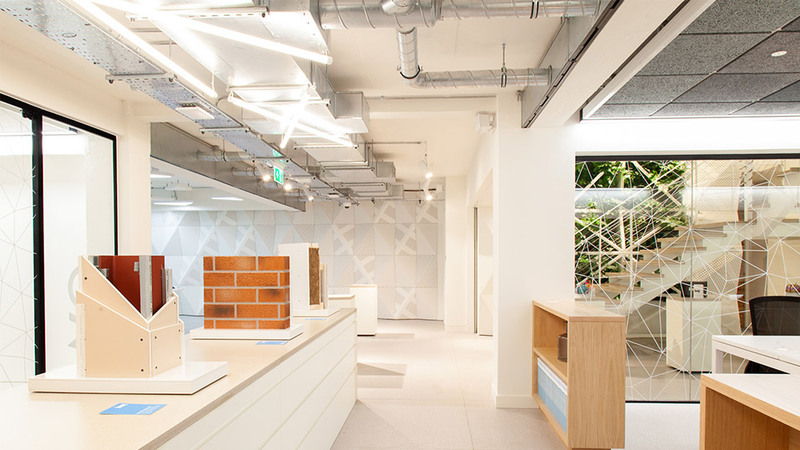 The result is a lighting solution that really supports the interior concept, giving the client a brand new retail platform.